The Cancer Vanguard is about driving innovation in cancer care. One innovation coming to cancer treatment right now is biosimilars. However, introducing biosimilars into a Trust can present some challenges. Biosimilars are a relatively new technology that is not always fully understood, especially in oncology. Knowing this, the Cancer Vanguard has done significant work to make sure it gets biosimilar adoption right first time. As part of this, the Cancer Vanguard has partnered with Sandoz in a Joint Working Project to share biosimilar knowledge and experience, for the benefit of patients and the NHS. The Joint Working Partnership has developed resources and tools (see below) to help the NHS consider any biosimilars, regardless of who makes them. NHS England has also published a resource on biosimilars: What is a Biosimilar Medicine? This website was created for healthcare professionals. If you are a patient, please go to the relevant patient support organisations’ websites, e.g. Lymphoma Association. 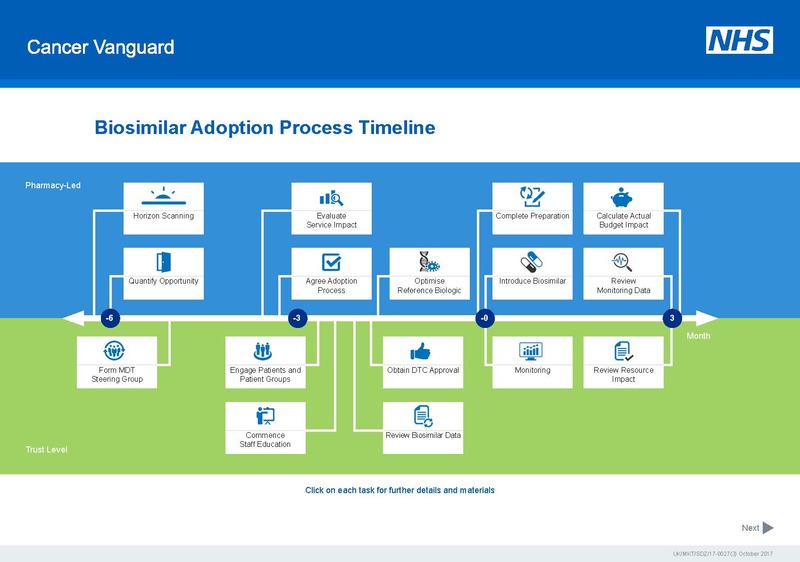 This resource is built around a biosimilar adoption process that the Cancer Vanguard has developed, taking into account other key initiatives around biosimilars in the NHS, including the National Biosimilars Medicines Programme Board (NBMPB). Following this process will help you share in the work and learning of the Cancer Vanguard. An interactive PDF is available to download that will provide you with the information you will need to help with adoption of biosimilars in your Trust. Within the PDF is a suggested process timeline (see image below), setting out the processes that pharmacy might follow, as well as more general Trust guidance on this. The timeline within the PDF allows you to click through to various tools and templates, created by the Cancer Vanguard team. The team was comprised of NHS and Sandoz representatives, bringing together their combined expertise in biosimilar adoption to help you introduce biosimilars into your Trust. You are welcome to download and adapt these resources to make them work in your Trust. These are linked to within the relevant steps in the process timeline which is in the PDF, and are also available below to download separately below. Following on from the Cancer Vanguard biosimilars project and the successful adoption of biosimilar rituximab, a similar approach is recommended for the introduction of biosimilar trastuzumab.